Gael Linn Oral Scholarship Exams at 139 St. Stephen's Green, Dublin. 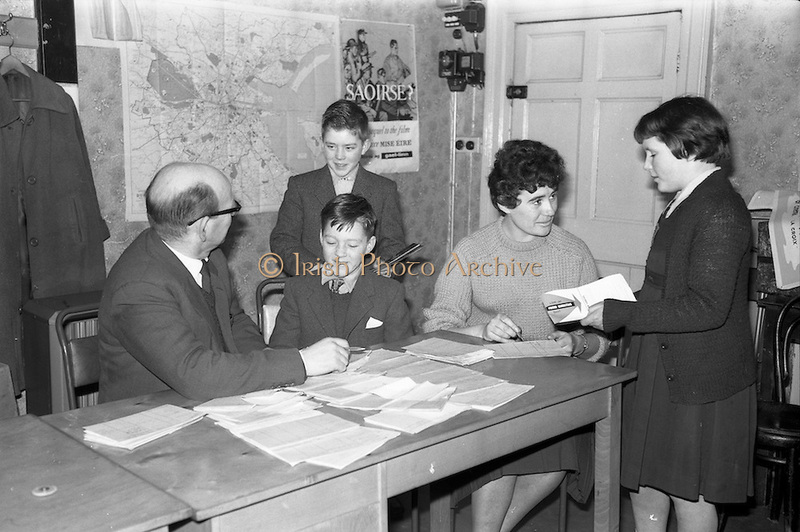 For these children January 8th did not just mean back to school after Christmas as they had won a 3 month scholarship holiday in the western Gaeltacht. On that date Micheal and his brother Seoirse O Tuathail (9 Wainsfort Park, Terenure) and Marion Ni Giolla Phadraig (36 Hollybank Road, Drumcondra) would join hundreds of other winners in the Gaeltacht. Examining them in Oral Irish were Aodh O Duibheannaigh and Nuala Ui Chaolaidhe (Gael Linn).